Extra scobys rolling around? Want to try a different kombucha flavor? Looking for a healthier twist on the morning coffee? How about brewing up some coffee kombucha? Adapted from Cultures for Health. In a glass or ceramic container, dissolve the sugar in the hot coffee and allow the mixture to cool to room temperature. Be sure the coffee is free of left over coffee grounds. Add the Kombucha scoby to the liquid. Unlike regular kombucha (made with tea), you don't need to add liquid from a previous batch because coffee is so acidic to start. Cover the jar with a tight-weave tea towel, paper coffee filter, etc. secured with a tight rubber band. This covering will allow the gas created during fermentation to escape while keeping bugs out. (Fruit flies love kombucha.) Label ferments with contents and date written on masking tape to make it easier to keep track of what's what. Allow the jar to sit undisturbed at room temperature out of direct sunlight for at least seven days. After seven days, start tasting the Kombucha daily using a straw. Halt the process when the Kombucha Coffee tastes pleasant to you. I brewed mine for seven days. A friend finished hers a few days before I did, and said it tasted terrible – very bitter. Mine tasted like mildly sweet coffee. Maybe it was the different coffees that we started with? You can also blend this with cream or kefir and some ice to make a whipped coffee drink, but I've just been sipping it straight. My scoby was very thin on this kombucha, frankly somewhat anemic looking. That's okay, because CFH advises you not to reuse the scoby after this brew. I drank some right away and bottled and labeled the rest for later. It's living in our “seasonal fridge” – the garage – where it's nice and cool. Coffee is very acidic therefore starter Kombucha tea or vinegar is not required (unlike when Kombucha is made with black, green or herbal teas). Because coffee contains oils, it is possible for rancidity to occur. Watch your batch closely and limit fermentation time to only what is necessary to achieve the desired taste. Never consume any Kombucha which looks, tastes or smells unpleasant. Coffee will generally stain the Kombucha Culture so you may see brown spots on the Scoby. Some people claim Kombucha Coffee brews faster than Kombucha Tea while others claim it is slower. Be sure to taste your batch regularly so you can stop the fermentation process at the point you find the taste agreeable. Kombucha Coffee should be served room temperature or cold. 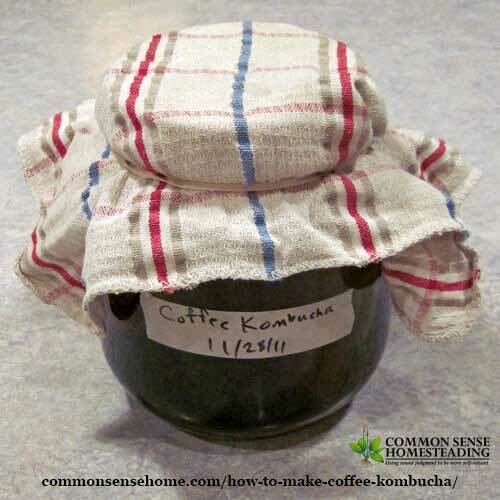 Do not heat the Kombucha Coffee as heating will destroy most of the beneficial yeasts and bacteria. 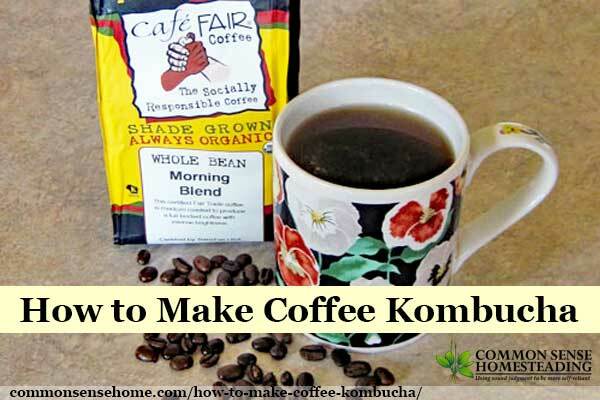 Some people find that Kombucha Coffee is less acidic to drink than regular coffee. In Wild Fermentation, the author discussed how they had used a scoby to ferment Mountain Dew, but I haven't tried that option. Have you experimented with other sweet liquids for brewing kombucha? I'd be interested in hearing about other options you may have tried. I'd never heard of that. That's why I like your blog so much. You are so learned in so many areas of home food preparation, as well as gifted at expanding our usual menu. Thanks. Hey Brigid! Thanks for stopping by, and thanks for your kind words. I don't get too crazy, but I like to try different things. Keeps life interesting, in a much more pleasant way than the Chinese curse. New to your blog, looking forward to reading previous posts & new ones! Carolyn – sorry your "booch" didn't work out. Is your water treated at all? That seems to be one of the most common problems. A fresh scoby with fresh kombucha from a recent batch is the most reliable way to get started, if you can find them. Angela – that was definitely not right. At most, mine has a mild vinegar-like smell, and even in the summer you have to be within a few feet of it to smell it. As with all ferments, if it smells truly nasty, it's better to error on the side of caution and try again fresh. Great idea. We were keeping kombucha for a while then it just got to where it took up to much valuable cabinet space and we would forget to process it. Next time we start it up again and we have an extra scoby I'll have to try this. 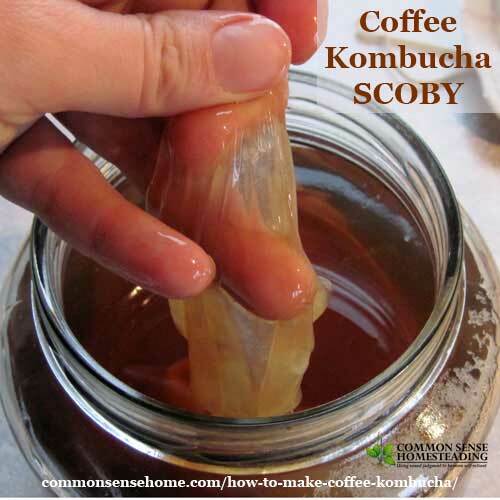 Hi I am from South Africa, Please how will I start a Kombucha scoby I cant find one here. All your fermented recipe sound so lovely I really would like to try. Kombucha scoby exchange worldwide has a few entries from South Africa – http://www.kombu.de/suche2.htm#southafrica . It looks like they are free if you can connect with the person listed and pick them up. 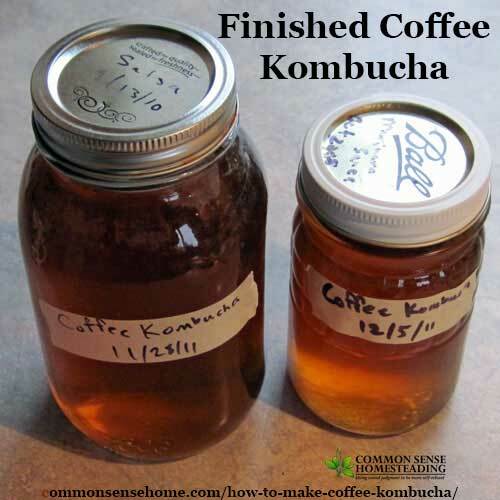 I understand that after making coffee kombucha you are not to re-use the scoby to make tea or other kombucha, but can you re-use it to make additional batches of coffee kombucha? Brewing in coffee weakens the culture, whereas brewing in tea grows a fresh daughter culture. I wouldn’t use the scoby again after culturing in coffee. Okie dokie. Thanks much for the information. We will see that scoby gets a decent burial as we celebrate her life drinking her koffuca. Just wanted to let you know that since we last spoke, 8 weeks ago, I’ve continued making coffee kombucha (coffucha) on a weekly basis and the scoby, which I broke “the rules” and continued to use, is so healthy and thriving that it continually grows right out of the gallon jar–pushes up against the towel and tries to get out and walk around a bit! I make 2 coffee maker carafes of coffee, about 14 cups, dissolve 1 cup of evaporated cane sugar in it, let it cool, and pour it in the jar in which I’ve left the incredibly healthy and expanding scoby and 1-2 cups from the previous batch. It’s on a continuous brew without so much as even washing the jar (the scoby has never left the jar). I was never a big coffee drinker but 1 gallon of this barely makes it a week and if I weren’t imbibing so many other fermented drinks I would have to make more, so it’s obviously delicious. Once in a great while I pour a few tablespoons of kombucha tea dregs into the jar, just to liven up the strains. I store it in the fridge in a couple half gallon jars for the few days that it lasts me after the 5-7 days it gets to brew before I’ve “got” to have it. Thanks for inspiring me to do this! I might mention that the scoby I started with was a regular little kombucha scoby. It is now the size of a pie. I may not have a green thumb in the garden but I can sure grow a scoby! I have two scoby (in 2 separate gallon jars) that I haven’t used for at least 2 months. Will they be good to use to make a new Kombucha? I really felt better when I was drinking the Kombucha so want to start drinking it again but want to make sure the scoby would be okay to use or should I get a new scoby from my son who makes Kombucha every week. The scobys would probably work, but it wouldn’t hurt to start fresh for a more vigorous culture. How much actual coffee do you use for two coffee pots.? I don’t drink coffee, I don’t own a coffee percolator. So I’m unfamiliar with how much actual coffee to use and it don’t recall it being mentioned in this post?? I don’t understand your question. It would depend on the size of the coffee pots. You would use as much coffee as recommended for your particular brewing vessel. Do you know if instant coffee could work instead of brewed coffee? the flavor profile will be different, but as long as there’s sugar for the culture to eat, it should ferment. Without sugar, the microbes starve. I haven’t tried it, but I don’t see why not. Freezing only slows down the beneficial microbes, it won’t kill them. I have frozen k-tea with great results! Little ice cubes of bucha go great in fruit smoothies and even seemed to have a zippy flavor/strength which was surprising to me. I gather them from the ice cube trays into a zipper plastic bag when they become solid. They work very well in all sorts of drinks actually! Yes, store as you would regular kombucha. It’s my understanding that Kombucha made with tea, doesn’t contain much caffeine or carbs (as the scoby absorbs a lot of the caffeine and sugar). Is that a true statement, and if so, would the same pertain to coffee Kombucha? Yes, it’s my understanding that what you said is correct for tea based kombucha and a similar effect would be expected for coffee kombucha. I don’t have a way to measure, but other sites indicate this to be the case.